On February 2, 2006, Peter-Hans Kolvenbach wrote to the members of the Society of Jesus in his position as their father general. He explained that a new general congregation should be convoked in order that his resignation could be accepted and his successor elected. When the 35th General Congregation of the Society of Jesus accepted his resignation when it met in January 2008, Kolvenbach became just the second (but the second consecutive) father general to resign in Jesuit history. The 224 delegates appointed to the congregation elected Aldofo Nicolás, a Spanish native, as his replacement as superior general. Like Kolvenbach, Nicolás had most recently served in Asia–most recently serving as president of the Conference of Major Superiors of East Asia and Oceania and as provincial of Japan. The delegates also approved six decrees. The wordcloud below represents the most used words in the decrees, with a larger size denoting greater frequency. All the decrees are available the interactive chart below. Search the titles or categories or filter the display based on the same categories. Also available below are addresses by Pope Benedict XVI, the delegates’ statement to Kolvenbach, and homilies by Nicolás. The full contents of all these documents, as well as the other Essential Documents, are searchable available through the Portal. They can each be browsed and downloaded individually. 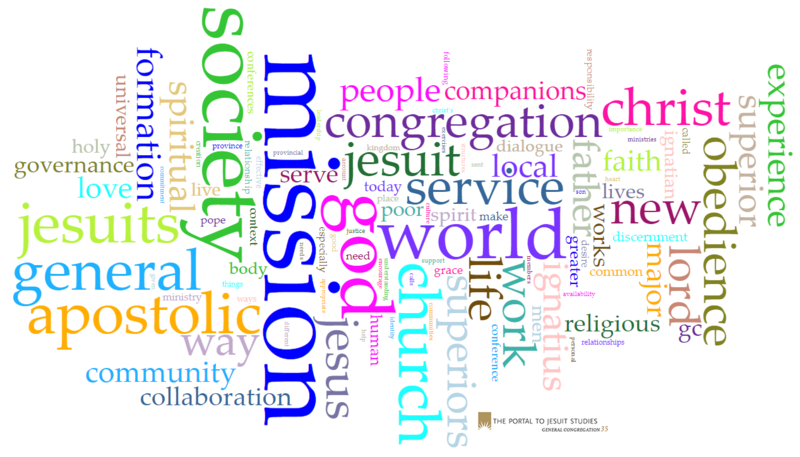 For more on the 35th General Congregation of the Society of Jesus—especially on the important historical context for the gathering—please consult Jesuit Life & Mission Today: The Decrees & Accompanying Documents of the 31st–35th General Congregations of the Society of Jesus, ed. John W. Padberg (St. Louis, Mo. : Institute of Jesuit Sources, 2009).